EHNAC recognizes that its accredited entities (“Accredited Entities”) and accreditation candidates (“Accreditation Candidates”) operate in a dynamic business environment that includes many business and legal variables ancillary to the fundamental scope of EHNAC’s accreditation process. However, because that environment involves business and legal risks that may impact (1) EHNAC accrediting operations; and (2) accreditation eligibility, EHNAC has developed a collaborative process to (A) enable Accredited Entities and Accreditation Candidates to identify significant business, financial, operational and legal developments that have the potential to compromise or undermine their ability to meet the EHNAC Accreditation Criteria (“Sentinel Events”) and (B) provide EHNAC with written notification of such Sentinel Events. Acquire timely knowledge of Sentinel Events (described in Exhibit A) that may affect the accreditation status of an Accredited Entity or Accreditation Candidate. Maintain credibility of EHNAC as a nationally recognized accreditation body. 1. What is a Sentinel Event? 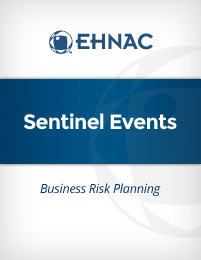 A Sentinel Event is any significant material impacting development, action or change in the business, financial, operational or legal status of an entity, which occurs (1) with respect to an Accredited Entity, after accreditation, or (2) with respect to an Accreditation Candidate, after the application has been submitted to EHNAC. The material impacting change in status may be based on any one or more of the Sentinel Events indicated below or described in the Sentinel Events Exhibit A. 2. Notification Process: When should EHNAC be notified? An Officer of EHNAC must be notified in writing of the occurrence of any Sentinel Event. Written notification in the manner described in Section 3 below must be received by EHNAC no later than three (3) business days from when the Sentinel Event occurs. Failure to provide such notification could result in loss of Accreditation, loss of Candidacy status or such other action as EHNAC may determine to be appropriate. 3. How should EHNAC be notified? As part of the notification process, the Accredited Entity or Accreditation Candidate shall provide an officer of EHNAC with the “known facts,” as determined to have a material impact, and shall continue to provide EHNAC written notice of additional relevant information as such information becomes “known facts.” The additional relevant information shall be delivered to EHNAC by an email sent to dhopkinson@ehnac.org or by a fax sent to (860) 760-6630. “Known facts” shall include, but not be limited to, (A) any relevant data, information or circumstances regarding a Sentinel Event having a material impact which an Accredited Entity or Accreditation Candidate (i) is required by law, by a contract to which it is a party, or by any other legal obligation to report or disclose to a third party, or (ii) has disclosed in a public statement or in any non-confidential manner; (B) reports or information that must be reported to a government agency; and (C) all findings of fact in the form of an agency action by a duly authorized regulatory agency or in a judgment by a court of original jurisdiction, notwithstanding any subsequent appeals. G. Appropriate documentation should be submitted along with the disclosures, e.g., press releases, etc. 4. What Constitutes a Sentinel Event? The following is an illustrative but not exhaustive topical list of Sentinel Events. Refer to the Sentinel Event Exhibit “A” document in the sidebar for detailed explanations. Entering into a new agreement to outsource a site that fits the definition of an In-scope Organization Site or an In-scope Outsourced Site. Financial impairment of an Accredited Entity or Accreditation Candidate. Change in ownership or control> 25%. Disruption of service to customers > 8 hours for telecom, or security violation. A security breach that is reportable as a matter of state or federal law. Workforce reduction by > 15%. Company fine(s) of > $100K for regulatory violations, marketing or advertising practices, antitrust violations, or tax disputes. Adding or significantly modifying an In-scope Organization Site or an In-scope Outsourced Site. Significant events associated with an In-scope Organization Site or an In-scope Outsourced Site including but not limited to the addition or significant modification of physical locations. 5. What is the EHNAC Review Process? Within seventy-two (72) hours of EHNAC’s receipt of such written notice, the Executive Director of EHNAC, if he/she deems the Sentinel Event to be of a materially substantive nature, shall convene a meeting of the Ad Hoc Sentinel Event Committee of EHNAC (“Committee”), consisting of three EHNAC Commissioners, to consider the matter. In determining its recommended course of action, the Committee shall consider the seriousness and time-criticality of the Sentinel Event. The Committee shall provide its written recommendation to the full Board of Commissioners within twenty-four (24) hours of the conclusion of its meeting, including, if recommended, the necessity for a special meeting of the Board of Commissioners to take action on any recommendation of the Committee. Other than the publication of any change to the status of an EHNAC Accredited Entity or an EHNAC Accreditation Candidate on the EHNAC web site, all deliberations by EHNAC on the report of a Sentinel Event, including its evaluation and recommendations, shall be kept confidential. Accreditation by EHNAC is awarded based upon its review of the organization for that specific “point in time” that the accreditation process occurred. EHNAC is not responsible for any changes in policies, procedures or controls, processes or access that may occur subsequently in which it has no visibility or is unaware. It is the organization’s responsibility to report significant changes to us through our Sentinel Events policy. 6. What Action May Be Taken by EHNAC? The Commission shall review the recommendation of the Committee on a timely basis, either at a special meeting of the Commission if the matter is deemed urgent by the Committee’s Report, or no later than the next regularly scheduled meeting of the Commission. Written findings and action taken by the Commission shall be communicated in writing to the affected Accredited Entity or Accreditation Candidate within two (2) business days of the conclusion of the meeting of the Commission. The written communication also shall include a description of EHNAC appeal procedures. Request for further documentation. If the additional documentation is not provided, revocation of accreditation. Request the organization to reapply and follow the re-accreditation process if it is determined that the Sentinel Event provides a substantive change to the entity. Such other actions as are deemed appropriate. Please Note: if an organization fails to respond to a high priority email from EHNAC within 7 business days indicationg their intention to proceed with the accreditation process then EHNAC will make the determination that the organization no longer intends to maintain their accreditation status and will be removed from the website and the organization will no longer be accredited on that date. Any change in Accreditation status pertaining to the Accredited Entity or Accreditation Candidate shall be posted on the EHNAC web site. Accredited Entity enters into a new agreement with an In-scope Outsourced Site. Accredited Entity adds or significantly modifies a physical location that would qualify as an In-scope Organization Site or an In-scope Outsourced Site. A significant event occurs associated with functions involving the creation, reception, maintenance, or transmission of PHI that are outsourced to third parties including but not limited to their addition of significant modification of physical locations. NOTE: A change in the organization’s contact individual having responsibility to liaison with EHNAC needs to be communicated within 10 days of a change in personnel so that there is no disruption in any notices or communications between the entities. The Sentinel Events document along with the applicant agreement must be signed and faxed to 860-760-6630 or uploaded through the EHNAC “Log an Application” portal, to which you are provided access after the Application is submitted. Note: The complete up to date Sentinel Events Document with definitions, links and exhibits can be downloaded from the link to the left on this page.